Pimelea sp. nova Schouten Island. Photo on right shows the raised leaf scars. The Royal Tasmanian Botanical Gardens is a constant source of botanical discovery for me. Every time I visit I discover something that I’ve never seen before. In my most recent visit I wandered over to the East Coast collection where I spotted a large robust shrub about 1.5m or so tall. To my surprise it was a species of Riceflower (Pimelea). Riceflowers belong to the Daphne family (Thymelaeaceae) from which we get our ornamental European Daphnes. In Tasmania, Pimelea is represented by some 17 different species of shrubs that occur in habitats as diverse as coastal heath to alpine shrubbery. The larger species of Pimelea in Tasmania are often called Bushman’s bootlace because of the tough bark that peels in stringy ribbons. The riceflower that was growing at the East Coast collection was probably planted there a year ago. It is an as yet undescribed species that was collected from Schouten Island, an small island just off the tip of the Freycinet Peninsula on the East Coast of Tasmania. Given the locality of it’s discovery, I assume it must be a lowland shrub. 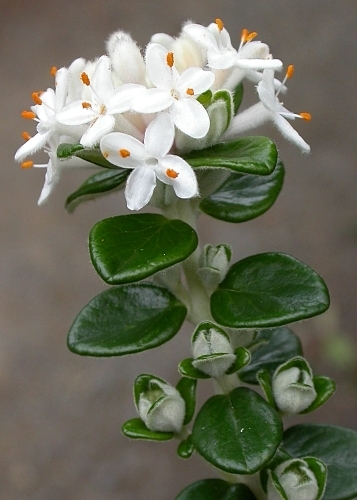 It was labeled as “Pimelea sp. nova Schouten Island”, ‘nova’ alluding to it’s newly discovered status. As first impressions go, the Pimelea sp. nova has the stature of the Bushmans Bootlace (Pimelea nivea). However, the leaves are have silky hairs on both the upper and lower sides unlike the Bushman’s Bootlace which is clearly hairless on the upperside and densely white hairy on the underside. As far as leaf details go then, Pimelea sp. nova looks more like the Mountain Riceflower (Pimelea sericea). However, the Mountain Riceflower is smaller in stature, has pinkish flowers, and as it’s name suggests, is a high altitude denizen. Another rather distinctive feature of the Pimelea sp. nova are the raised leaf scars. From written descriptions, the Silver Riceflower (Pimelea milliganii) also has such raised scars. Other leaf attributes also match Pimelea sp. nova quite closely. 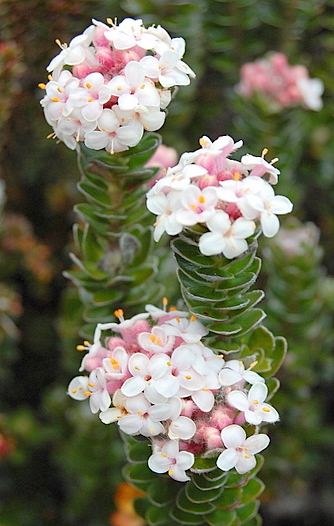 However, the Silver Riceflower is also a high altitude species and only known from the western mountains of Tasmania. The key characters then that distinguishes the Schouten island riceflower must be its robustness and its habitat. Still, I look forward to reading the formal description of this new and interesting species in the very near future. This entry was posted in Key Characters, Plant Morphology, Shrubs, Tasmanian Endemics and tagged bushmans bootlace, Daphne, mountain riceflower, new species, Pimelea milliganii, Pimelea nivea, Pimelea sericea, Pimelea sp. nova, riceflower, Schouten Island, silver riceflower, Thymelaeaceae. Bookmark the permalink.